Airtime was a video chat service founded by Sean Parker and released in 2012. The unveiling of the original product was a star-studded event, but the service itself folded pretty quickly. However, the original Airtime was an online only video chatting service like ChatRoulette or Omegle. With big names like that having already been established for a few years, Airtime was never really going to work out that well. Airtime hasn't gone offline forever though and instead Parker has brought it back and it's nothing at all like the app it used to be. 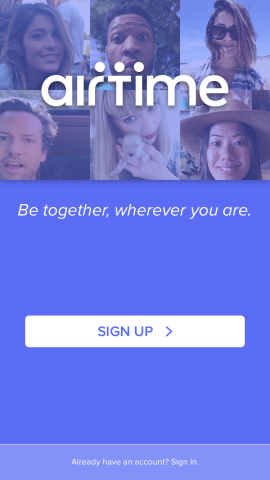 This Airtime 2.0 is a messaging app that will allow you to jump in and out of video chats easily. You'll be able to have multiple groups and rooms and whenever you enter them it'll be an automatic video chat with whoever's there. This does suggest that maybe you should be a little picky about who you choose to talk to on there, but it's an interesting idea. Video chatting isn't the only thing you can do in those rooms either; Airtime also allows users to watch videos together within the app. Of course, there are services that allow users to watch things together online already, but none like this. This should allow you to see friends reactions to what you're all watching though that isn't certain. This is a lot more intimate than other video watching services and it is brand new within the messaging market. Meerkat is reportedly working on something similar, but this has been on the books for Airtime for years so it might be some time before they're competing. Airtime 2.0 is the result of several different app attempts to test features, but only OkHello back in 2014 really got them any attention. That app was basically just a re-branded version of Airtime only it was released without all the fuss. OkHello managed to keep a steady user base and Airtime 2.0 should hopefully gain a similarly consistent base. Fortunately, the fact Airtime isn't getting a huge unveiling and is providing something new should help there. The app will be available on both iOS and Android from the 28th of April, but Android users be warned, your version of the app is still in beta phase so you won't have all the features that the iOS version has just yet.